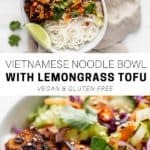 These Vietnamese noodle bowls with lemongrass tofu make for a healthy fresh meal that is completely vegan & gluten-free! Oh Vietnamese food, how I love you so! Especially Vietnamese bowls. THEY. ARE. THE. BOMB. 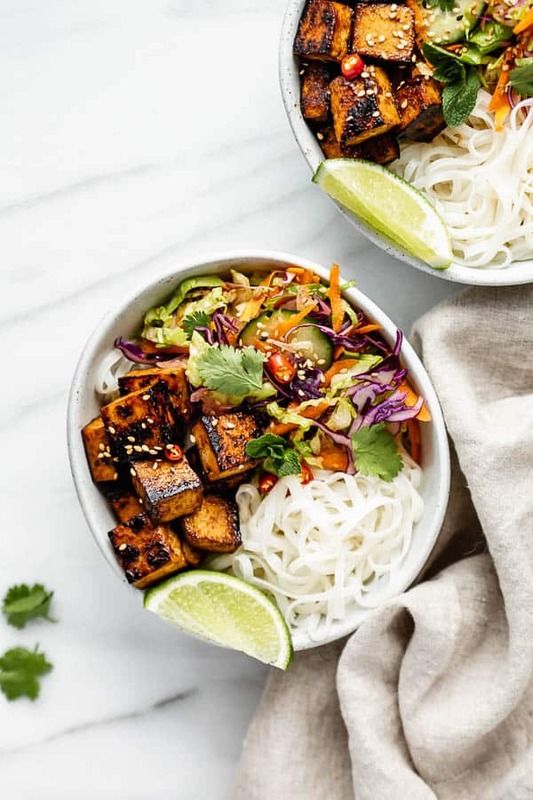 These noodle bowls are made with traditional Aisan rice noodles, topped off with so fresh salad, and some marinated lemongrass tofu that gets crisped up to perfection. Like omg, these bowls are the real deal friends! One thing I love about these bowls is that they’re so perfectly balanced. 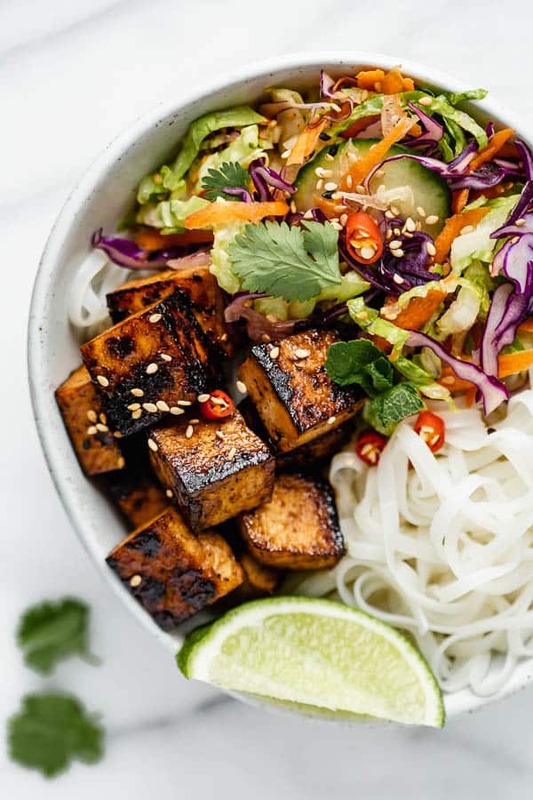 We’ve got some rice noodles for the carbs, some crispy tofu for the protein and some fresh and light salad for some veggies. 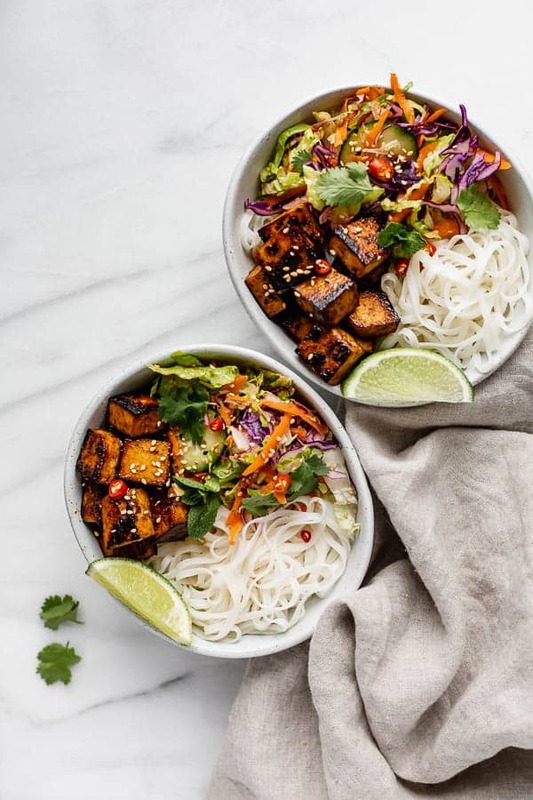 Vietnamese noodle bowls are made with rice vermicelli, (or noodles) a protein, (traditionally grilled pork or chicken) and some salad. 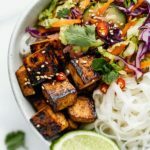 The bowls are typically served with a fish sauce type of dressing, but for this recipe we’re doing a soy sauce based dressing! The elements are then assembled in a bowl and served with some sriracha spicy sauce, lime and cilantro on the side. 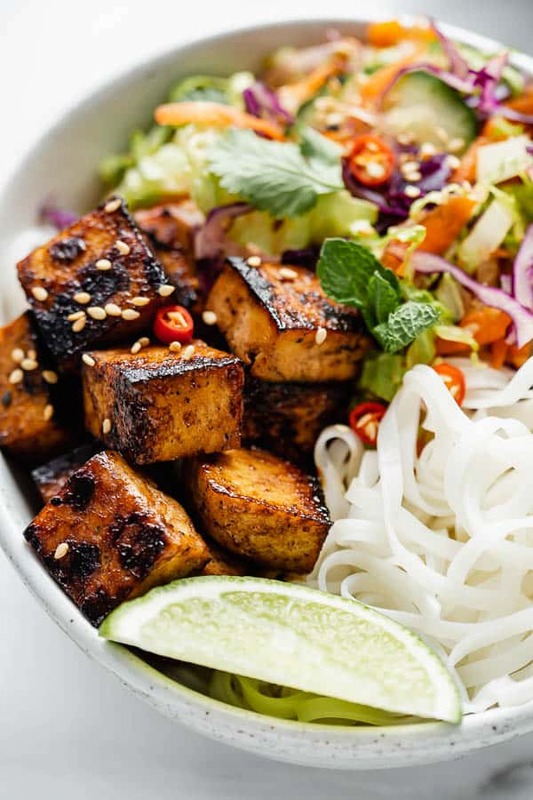 The marinated tofu in this recipe should be left to marinade for at least 1 hour, though if you have the time I’d recommend to let the tofu marinade overnight. This will really intensify the flavour! You’ll want to use a good non-stick pan to cook the tofu and make sure you’re pan is well coated with oil to prevent the tofu from sticking. You can also alternatively bake the tofu if you prefer at 450 degrees F for 25 minutes, flipping it halfway through. Make sure to remove the lemongrass stalks from the marinade and not to eat them. They are very tough and not pleasant to chew on! 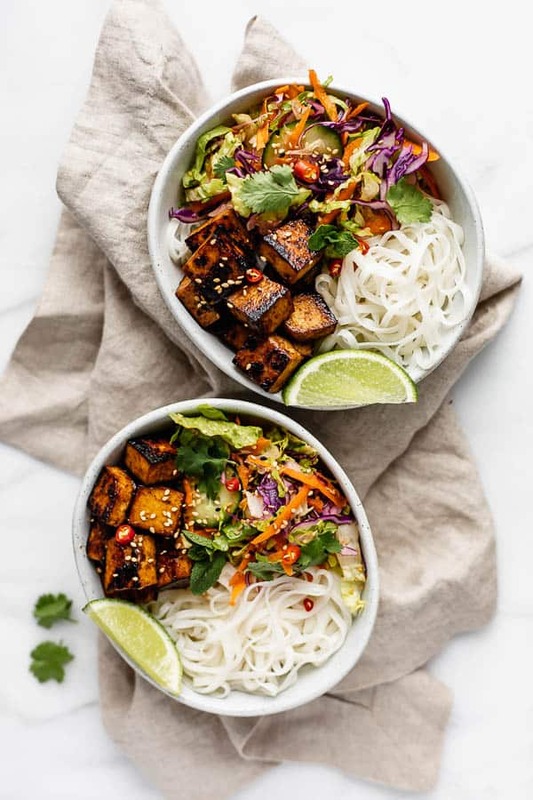 These Vietnamese noodle bowls are loaded with rice noodles, lemongrass tofu, and salad for a simple healthy and delicious meal! 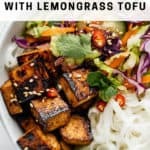 The tofu is even better if you have time to let it marinade overnight! Seriously the best tofu marinade! I added some edamame and sliced broccoli to the salad and it was delicious! Do you have to press the tofu first? Hi Anna, if you’re tofu seems a bit liquidy you can press it. I generally don’t bother because I use a really firm tofu!